Its 15th August 2018 today and we are celebrating 72 years of being free. I am feeling a little less patriotic today. Received plethora of patriotic messages around Independence day and videos and none of them seems to move me even a bit. Are we free today? Or rather are we all free today? Is the freedom equally bestowed all across the country? Is every family celebrating this day with equal happiness and proud? The answer is a big NO. A day which might be just another national holiday for you is a matter of great responsibilities for some people. While you get to enjoy waking up late, there are people on high alert all through the night just because it is Independence day. While you flood Instagram with #IndependenceDay posts, there are places where the network has been disrupted just to aid the peaceful atmosphere of the country. And I wouldn’t complain if that was all but there are families who have lost their loved ones just so that you keep embracing this freedom. 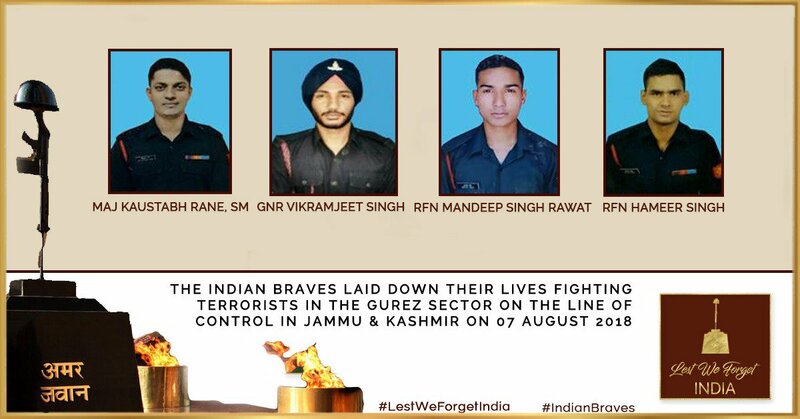 On 7th August 2018- Maj Kaustabh Rane, SM Gnr Vikramjeet Singh, Rfn Hameer Singh and Rfn Mandeep Singh Rawat laid down their lives while foiling infiltration bid in North Kashmir. Did you forget the scenes from Major Kaustubh Rane’s last rite? It was all over the internet just a few days before, is it that easy for you to forget. 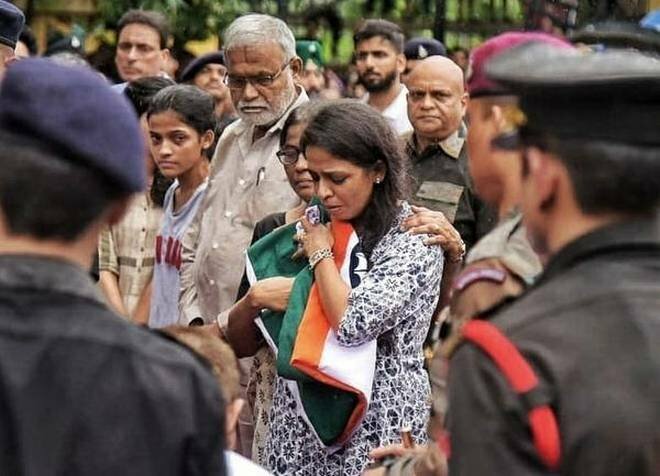 Can you imagine the price that Major Kaustubh Rane’s family has paid for this freedom? I still cannot get over the pictures of his 2-year-old son. Those little eyes kept looking all around trying to make sense of the whole mayhem. That 2-year-old son lost his father before even properly understanding the meaning of a father. His life is changed forever. The grieving wife will live with a void which can never be fulfilled. If given a chance wouldn’t these people cheat on your freedom and save their loved ones. I know you would do it but some men are made of steel. 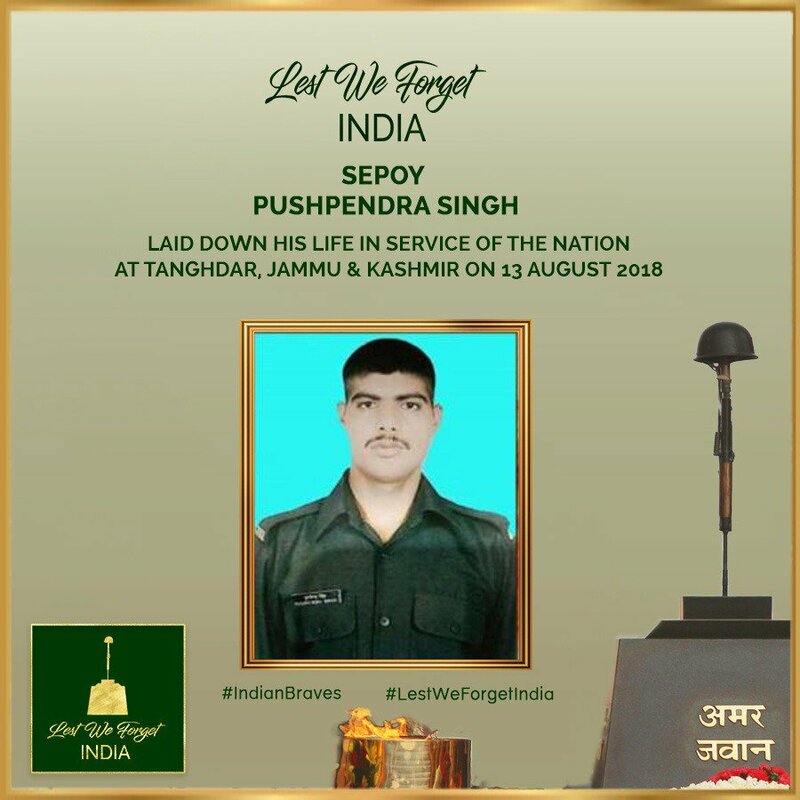 On 13th August Sepoy Pushpendra Singh was martyred in the line of duty. He is survived by a wife and a 10-month-old kid. Can you imagine the depth of the scar that the kid will grow up with? The pictures of the Sepoy and a small video of his wreath-laying ceremony is all over the internet. It will haunt me for several nights. 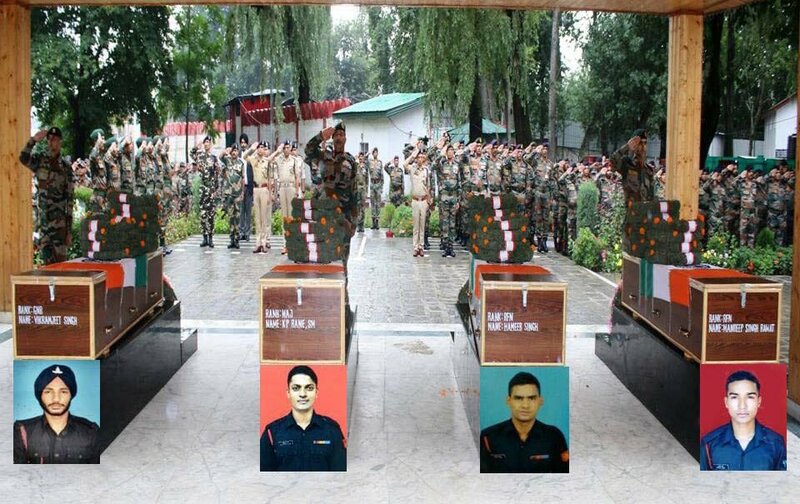 I was not over Major Kaustubh Rane’s and 3 other soldier’s loss and here comes another sacrifice. It might sound unbelievable but I haven’t slept peacefully in the last week. I have cried my eyes out thinking about the families and what could more happen to our men out there. 15th August can be the Independence day on the books but for me, it will attain its true meaning only when the men at the border can relax just like the whole country. The country will only be free when we don’t have to trade lives for it. The freedom and Independence achieved at the cost of tears and bereavement can never be fulfilling. I am sorry for not feeling patriotic today, purely because I am sadder for those families. This celebration will end tomorrow but there is no end to their miseries. While I write this I mean no disrespect to the great sacrifices that were made to get this freedom in the first place. I have high reverence for everyone. But the only question that keeps bouncing back is haven’t we made enough sacrifices already? Isn’t it the time for everyone to relish the flavour of this freedom equally. Why some still need to lose their loved ones for the already achieved freedom? Wishing you all a very happy Independence day. The Trip My Heart Longs For ! Of Train Journey And Telephone Conversations ! Did Social Media Help During Chennai Floods ?